you may see on the shoreline. These honu can usually be found basking in the sun, or resting on the black sand beaches along the shoreline. The turtles are brown all over, grow to about three feet in length and can weigh up to 400 pounds. Their name, Hawaiian Green Sea Turtle (honu), originated from the color of their body fat, which is green from the vegetation they eat from the rocks on the shoreline. Originally hunted by the Polynesians and other Pacific Islanders, the Hawaiian Green Sea Turtles are now protected by state and federal laws. They are listed as endangered by the International Union for the Conservation of Nature. After playing hard with us in the Pacific Ocean, our French trained personal chef (and our local connection) went home to prepare Aloha Dinner #2. We were, after all, on vacation. The Balsamic Vinaigrette is Marcella's adaptation from a recipe she learned in cooking school. She has graciously shared it with us. Put vinegar and water in small bowl. Whisk in the salt, pepper and mustard. Add the shallots, garlic and herbs and whisk. Add the olive oil and whisk until smooth. One of the highlights of this vacation was visiting with our dear friends and locals Marcella and Joe Ramirez. Marcella is a personal chef and Joe was her sous chef. They happily prepared several meals for us during our vacation. Everything she prepared was delicious. The Opa was a very light and fleshy fish which was lightly breaded and pan fried. The Coconut rice was very rich and Marcella kindly shares her recipe. She credits the recipe to the Hawaiian Cookbook by Roana and Gene Schindler. Saute onion in butter until golden and reserve. Cook rice as per recipe for boiled rice substituting coconut milk for water. Care must be taken to simmer the coconut milk, do not boil or it will separate. When the rice is done, add the sauteed onions. Marcella notes: You can add 1 T of onion soup mix in place of the fresh onions. Also, if you want to cut down on the fat use half water and half coconut milk. Combine all ingredients, allow to marinate, and serve. Yum. This was a colorful accompaniment to the meal. It would be delicious on lettuce or with toasted pita chips too. The flavors danced in your mouth. Have we mentioned that we were thoroughly spoiled? and that we ate well while on the Island? One of the first things we did in Hawaii was to visit the two farmer's markets in Waimea to stock our pantry. The flowers were of interest to us as Brother in Law Phil is an orchid grower so that booth was exciting. Angelica and I loved the cut flower booths and admired the variety of fragrant and hand crafted Lei's that were available. But the bounty of the Island grown fruits, veggies, meats and cheeses was fabulous. Later in the week we made it to the Farmer's Market in Hilo which is even larger and more glorious. Needless to say - we ate well! These fabulous papayas were less than 20 cents each. We bought several, pureed them with a bit of freshly zested lime and the lime juice along with a touch of sugar, and topped our Vanilla bean ice cream with a citrusy sweet papaya sauce. Sublime. Whenever possible, our vacation adventures will include an Afternoon tea; and our excursion to the Big Island was no exception. An afternoon visit to the Hawaiian Vanilla Company proved to be a delightful experience. A bamboo tray with four green leaf-shaped serving bowls were presented to us to sniff and smell before selecting our tea. We could choose the signature Vanilla flavored black tea, the Mauna Kea Sunset (black tea with cinnamon & vanilla flavors), a caffeine free rooibos, or Emma's Garden, a premium green tea with vanilla, rose & lavender blossoms. The kids opted for the Vanilla Lemonade. 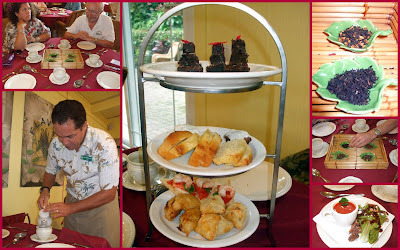 The Upcountry Tea at the Vanilla Company provided a relaxing and elegant afternoon in the tropical rain forest setting. Once we received our tea, we were presented with a plate that featured a tomato bisque and farm fresh organic greens with crumbled feta cheese, vanilla honey peppered pecans topped with a vanilla raspberry vinaigrette. The 'Tower of Delights' was formally presented and included a delicious assortment of sweets and savories. The savories were wrapped in yummy pastry shells and accompanied by an assortment of chutney and mixed toppings. There was a pound cake that was served with a sweet papaya glaze, and a tower of double chocolate brownies with a raspberry glaze. All beautiful, all quite tasty. Following the Afternoon Tea, we were introduced to vanilla bean farming on the Island by owner Jim Reddekopp. And, many Island harvested vanilla beans were purchased that day and have been transported to the Mainland. A beautiful afternoon, a relaxing day, enjoyed by all. horses, adventure, volcanoes, and more. As the days pass, we'll share our journey. In the meantime, there's news, mail, email, phone messages, laundry, jet lag, and general business to catch up with along with memories to file. As with any vacation, there's no place like home. It's good to be home! I've been working hard studying.... Hawai'i blossoms, Hawai'i Flowers and Trees, Tropical Trees of the Pacific, Tropical Trees of Hawai'i, Hawai'i Gardens. Oh I've looked at a couple of travel guides too. Now we are taking the exam..... Aloha! Seeds have been worn for ornamentation for at least 40,000 years. I have a fascination for botanical jewelry. Seeds are readily available to the local cultures and they have so many uses and so much lore surrounding them. Seeds are used for adornment, to heal, to protect, to bring good luck, to ease childbirth, as a form of weights and measures, for soap, for rosaries, for ceremony, for ivory, for fragrance, to protect from the evil eye and much more......for food, to the tourist trade. All of these uses are captivating. In addition to all of those uses, they all look so unique and this is how plants reproduce! Many of the seeds above are called Sea Beans or Drift Seeds- these world travelers hitch rides on the oceans currents and then are often found on the beaches in temperate climates. They often have a large tough outer pod that's either thick or spiny or both to protect them through the journey. The large black bean above is called a Sea Heart. It can be polished in a stone tumbler and engraved. All these beads came home with me from a trip to the Peruvian Amazon. The locals handcraft these necklaces to trade with the ecotourists. One t-shirt = one necklace. The orange and black seed is the Ormosia and offers protection from the evil eye. The large brown seed in the middle is the Crabwood Sea Bean when rattled together they chase away spirits. These are some of my other favorite necklaces. The one on the right is commonly thought to be apple seeds but is actually a legume, Leucana glauca. The colorful corn necklace is a reminder of our trip to the Southwest. Many seed necklaces are made to use in prayer. The Japanese Buddhists use peach and plum pits, The Neem Tree or China berry was frequently used as a rosary. The Holy Basil seed is sacred in India. Of course, many many people remember the Job's Tears, a popular necklace in the late 1960's. You know, Love Beads. The colored (lacquered) seed bead jewelry is usually made in China. The large dark necklace in the middle is actually rose beads made from a paste of the Rose petals. The Rose has been a native flower for 35 million years. It grows in every state and has been referred to in both the old and new testaments of the Bible. Beads for rosaries were first crafted by Christian Monks. In 1208 Saint Dominic first coined the term "rosary". 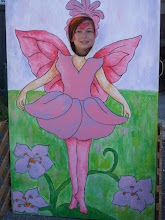 Our friends at The Essential Herbal have done a blog post on making rose beads. Not seed beads, but other botanical jewelry in the collection. The middle piece is an Edelweiss Flower from a long ago trip to Austria. On the left is very fragrant and much coveted Sandalwood beads. Sandalwood is suffering from derelict harvesting practices. On the right are pieces off various gourds. I also have a spice necklace made of cinnamon sticks, cloves, nutmegs, ginger, tonka beans, cardamon, star anise and allspice berries. They are fairly easy to string yourself and are fun and fragrant too. This is a Hawaiian Good Luck Bracelet. A treasure found at a yard sale, it came with a card listing the names of the seeds. Starting at the top: Lucky bean, Job's Tears, Sea Bean, Mauna aloa and wili wili, Macadamia, Elephant Ear and Job's Tears, Goat Eye, Hawaiian Pearl and Sand Box. Kukui nuts make the most striking Seed Bead Necklaces. The Candlenut tree, Aleurites molluccana grows all throughout the Hawaiian Islands. Allegedly very easy to recognize (we'll verify that!) as it grows to 90 feet in height with a smooth straight trunk for 40 or so feet until it branches out! This nut was of great value to the early Hawaiians for light, navigation, fishing, tanning, dyeing, food, medicine, catching birds, ornamentation and even for the detection of criminals! Can you imagine all that? The nut provides an oil which was used for light, the oil was also used on fish nets to tan them and hinder decay. The nut and the root were used as a dye of fabric and even for tattooing. Poisonous if eaten raw, if you roast the kernels with salt and red pepper it makes a relish that was served with the dry ink bag of squid. Used for skin diseases and also as a purge for infections. To catch criminals, the Kahuna or priests would start a fire. Kernels of a kukui nut would be thrown in the fire while the Kahuna uttered prayers usually asking for the thief to be killed unless he stepped forward. Once the culprit made himself known, as they usually did, then he would be fined heavily. As the white man came to the Islands the importance of kukui in the economy declined. The oil was used similar to a linseed oil and was gathered in large quantities and exported off the Islands. At one time as much as 10,000 gallons of Kukui oil was exported. What a history this plant/nut has. I wear my jet black kukui nut necklaces with pride and am eager to see this majestic tree on our Hawaiian tour. Our cousin discovered this You-Tube video and shared it with us. This is a video of our Aunt Hildegard E. Peplau, the older sister of Bertha Peplau Reppert, our Mother. It is exciting to see her share photos of her parents (our grandparents), and also tell a little bit about her beginning years as a nurse. Hope you enjoy this peak into yesteryear, I know I did! So for Christmas, one of my favorite gifts was this treasure found by my husband David Brill. A bottle of Roots! A product of Art in the Age. this alcoholic delight contains anise, allspice, cardamon, cinnamon, spearmint, lemon, smoked black tea, wintergreen, clove, orange, nutmeg, sugar cane and birch bark. All those herbs, spices and tea give this beverage a Root Beer Flavor. Based on the Root Tea which was quite a popular Pennsylvania drink (still is with the old timers) and then transformed into the syrup to make Root Beer. You can read the full story of Root here. David and I toasted the New Year with a shot of Root. It has a strong 80 proof flavor of Root Beer. Too strong for me to sip straight but mixed with gingerale.......now we're talkin'. 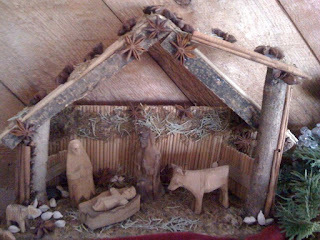 The hand carved olive wood figures from the Holy Land stand in a creche decorated with anise 'stars', cinnamon bark on the pillars, whole cloves tucked into crevasses, cardamon and nutmeg seeds, and dried rosemary (for remembrance, of course). 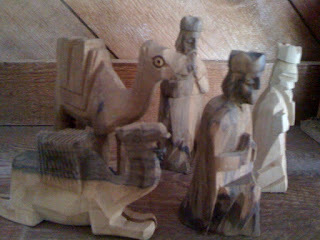 The original creche is made of small branches, bark, and bamboo or reed, and moss. It was always natural looking, but I like it so much better with the added herbs. It was easy to glue the herbs on with white glue. The creche fragrances the whole room. January 6th is Epiphany, the last of the Twelve Days of Christmas when the three kings following a bright star made their arrival in Bethlehem. 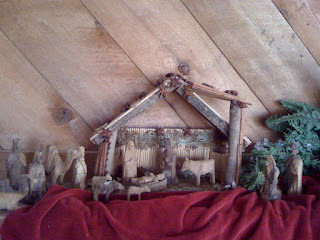 Thanks to our sister Carrie for sharing her Creative Creche with us! A charming natural sachet from the 17th Century. 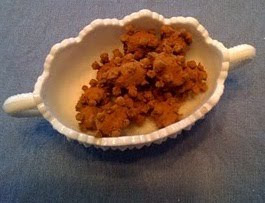 Fruits stuck with cloves and then rolled in a powder consisting of cinnamon, cloves and orris root. Dried on our radiators they are fragrant and last for years and years. Orris root is the root of the Florentine Iris and is used as a fixative in pot pourri and in pomanders. A fixative helps to hold the scent and also to absorb moisture due to humidity. It won't absorb moisture if the oranges have not been dried properly. Our old Civil War Era homes have radiators which provide a great drying spot during this cold time of year. It dries the fruit and fragrances the room! If you don't have radiators the hot water heater will offer a good drying spot. Some folks string a ribbon around or through the pomander so that it can then be hung in the closet as a sachet. Pictured here are little kumquat pomanders which don't require nearly as many cloves as a large orange. You can use oranges, lemons, tangerines, kumquats and even grapefruits. We use a nut pick or a nail to make a small hole through the skin of the fruit and then it is quite easy to push the clove in. For a pomander making tutorial using lemons, visit our herbal friend, Tina Sams Essential Herbal blog. Yesterday we celebrated Super Scone Sunday in the tea room. We like to vary the scone toppings, so we served Orange Curd instead of the usual Lemon Curd. A guest requested the Orange Curd recipe, and we're happy to share. Although very similar to Lemon Curd, it has a less tart flavor and slightly thicker texture. In large microwave safe 4 c. measuring bowl, whisk eggs until well blended. Add remaining ingredients, whisking until combined. Place in microwave, and heat in one minute increments, whisking after each minute, for approximately 4 - 5 minutes, until the curd thickens and 'puffs' up. Cover top with saran wrap and place in refrigerator overnight before serving. The Orange Curd will thicken as it chills. One of our New Year's Resolutions is to have more fun! and we will begin working on that resolution as we prepare for some 'fun in the sun' in celebration of the 50th birthday. . . . Hawaii 5-0 style! In a few short weeks we're off to the Big Island of Hawaii ~ 12 of us, in a rental house ~ If you have any suggestions and/or recommendations of 'must -do's' while on the Big Island, we would appreciate your thoughts! In the meantime, let the fun begin!